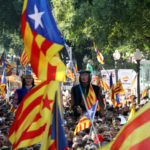 José Luis Martí argues in Verfassungsblog that the Catalan secession referendum is illegitimate because it violates the Spanish constitution and is supported by only a minority of the Catalan electorate. I would argue that the reactions of the Spanish government are making that referendum legitimate. It would have been the duty of the Spanish parliament and government to amend the constitution to allow for Catalan self-determination, a cardinal principle presupposed by all international law. By outright refusing any constitutional debate and signaling the no intent to allow for Catalan self-determination in the future, the Spanish authorities invited the unconstitutional referendum. Switzerlands approach to the Jurassian separatist movement clearly shows a peaceful and democratic solution to secession movements is possible. But Spanish authorities went further by subverting the Catalan referendum instead of cooperation with the aim of guaranteeing it’s citizens a fair vote. If only a minority of the Catalan electorate support independence, Spanish authorities could have supported a democratic decision that would have led to a fully constitutional result. By thwarting a fair democratic decision by force instead of awaiting it’s outcome the legitimized it’s claim for independence. The burden to show majority support by allowing a fair referendum must always lie with the state in control, not with the secessionists as they, by themselves cannot guarantee a fair, legal and democratic process.